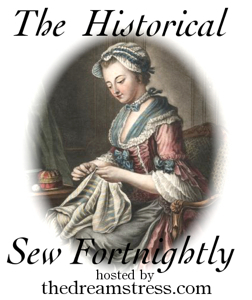 For the HSF nr 19 – HSF-Inspiration (draw inspiration from any of your fellow HSFs items), I decided to make a pair of 18th century sleeve cuffs. 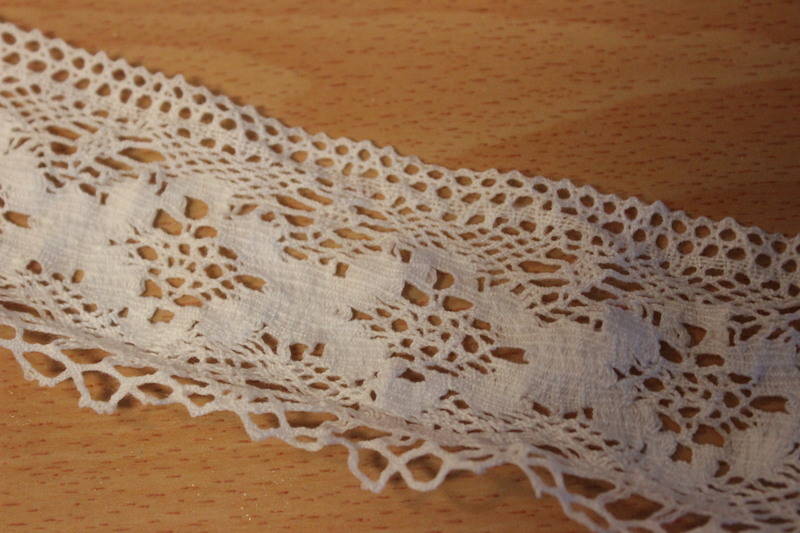 I found a 6 m long piece of lace in my stash, and decided to use it for this project. 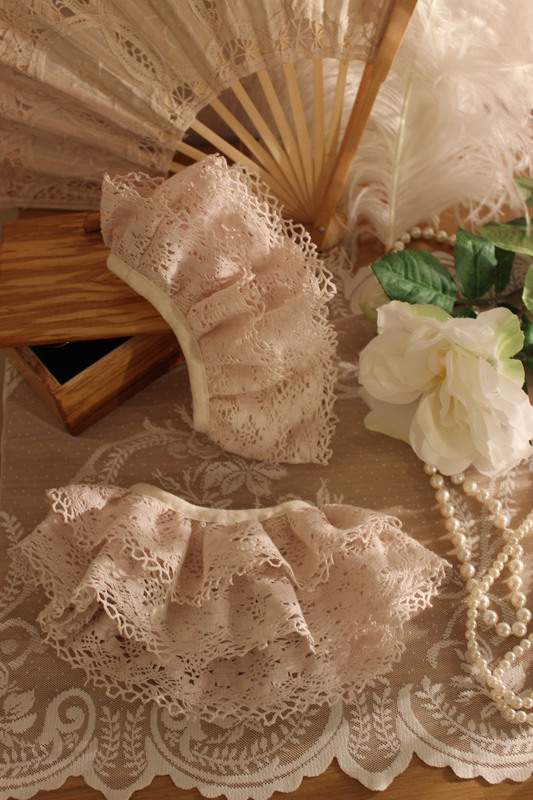 I originally had some much more delicate lace in mind for this project, but I couldn´t find any I liked in a reasonable enough price range. 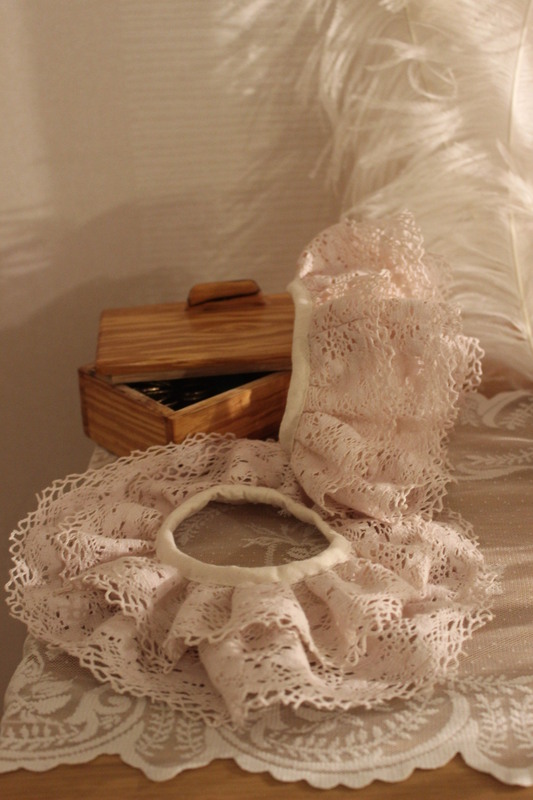 So the white lace it is. The only problem was, it was too white. 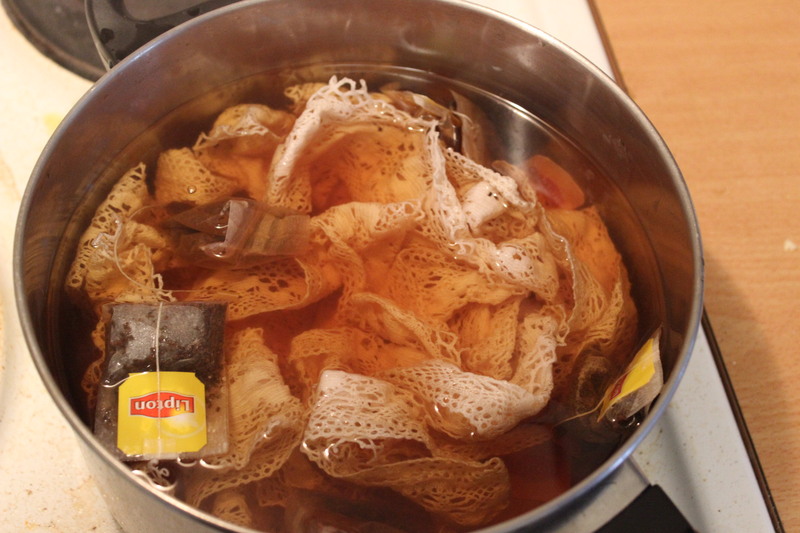 After some debating with myself, I decided to try to tea dye it. And so I did. The salt´s for setting the color. Cooking away on the stove. 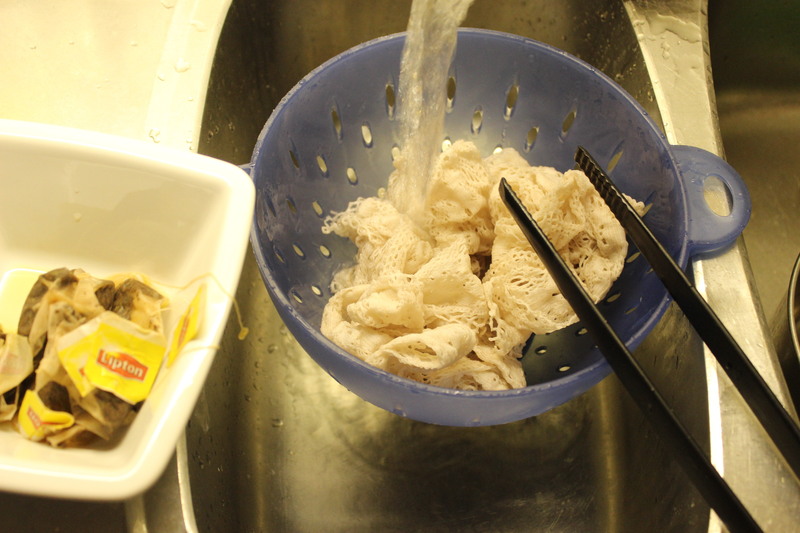 Rinsing the leftover color out. 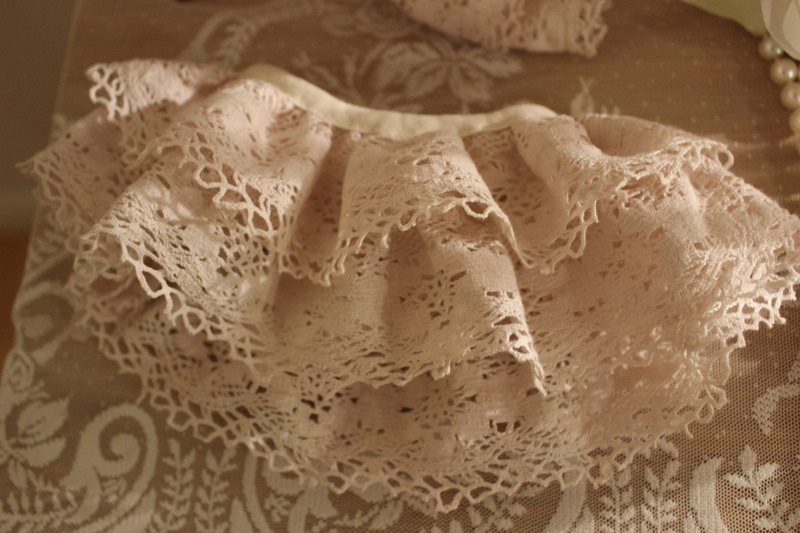 When dry, the lace was in dire need of some ironing. Then it was time to start on the cuffs. 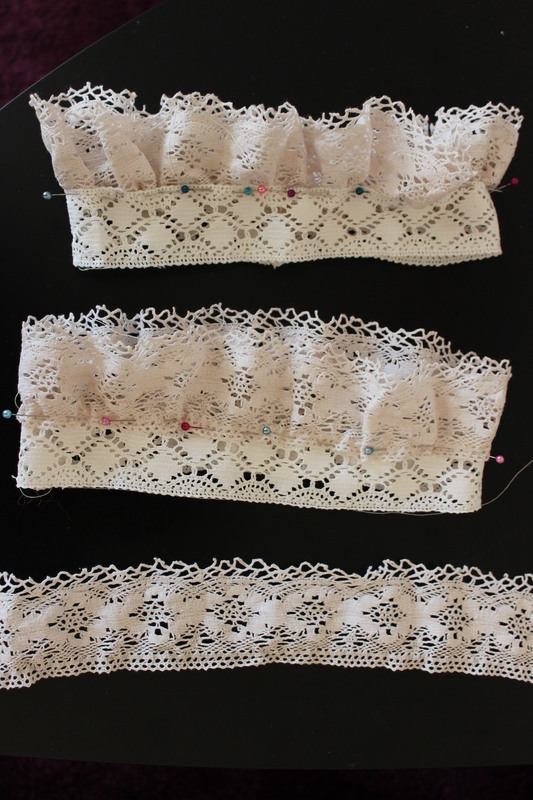 I decided to use two different kinds of lace, using the middle one as extension on the second layer on the cuff. 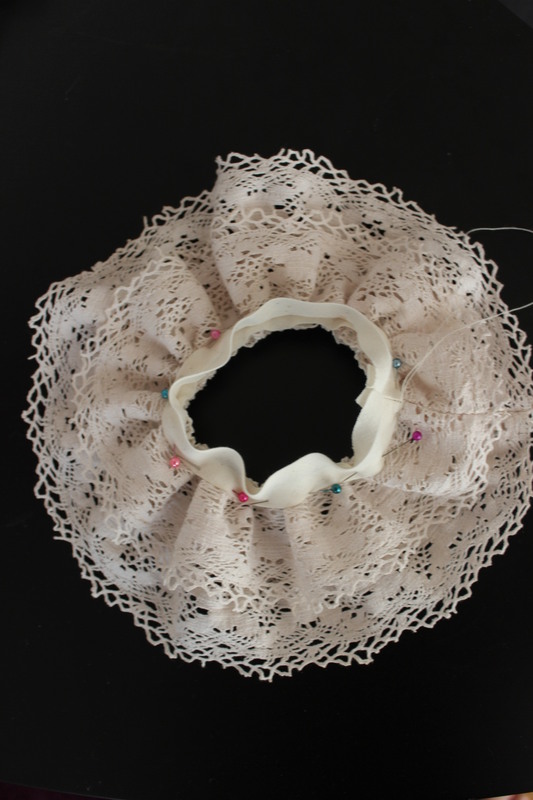 So I stitched the edges of the pieces together, creating different sized circles of the lace. 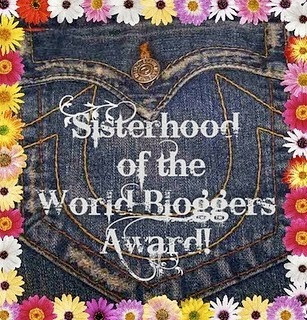 then I gathered and pined the pieces together. 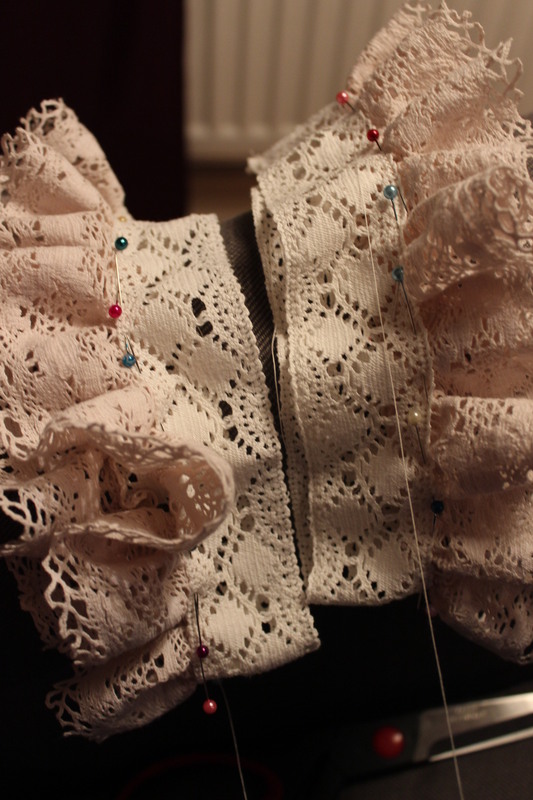 But then I realised that once the extension lace was gathered into the bias tape, the cuffs would be too puffy. 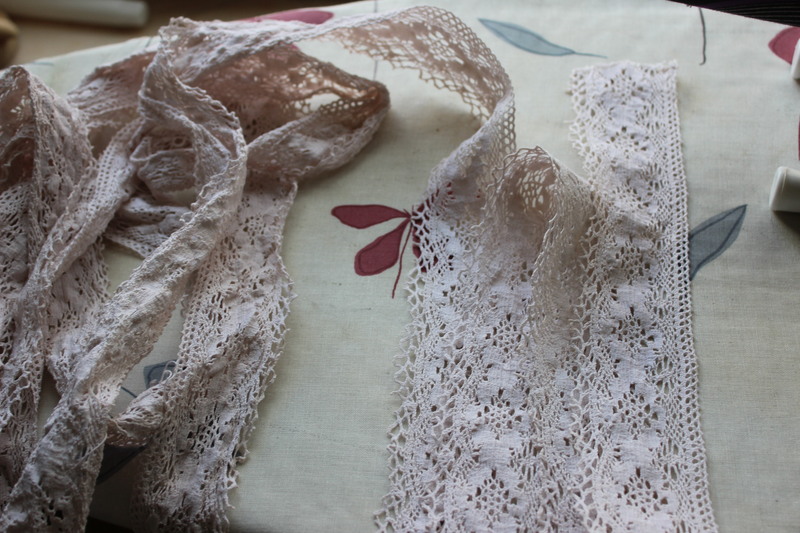 So I decided to trim a piece of the longer lace to get a more modest gather to start with. The bottom piece are the one cut of. Then I pinned the second layer to it. And finished of with the bias-tape. 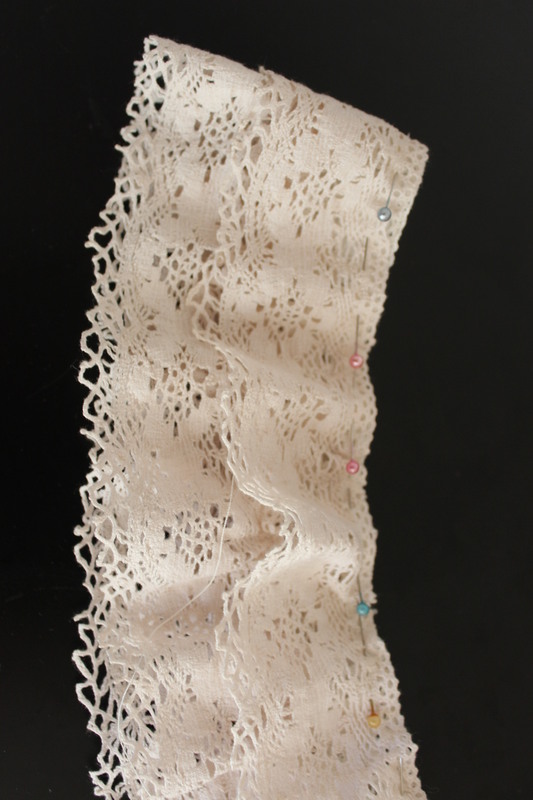 What: 18th century lace cuffs. 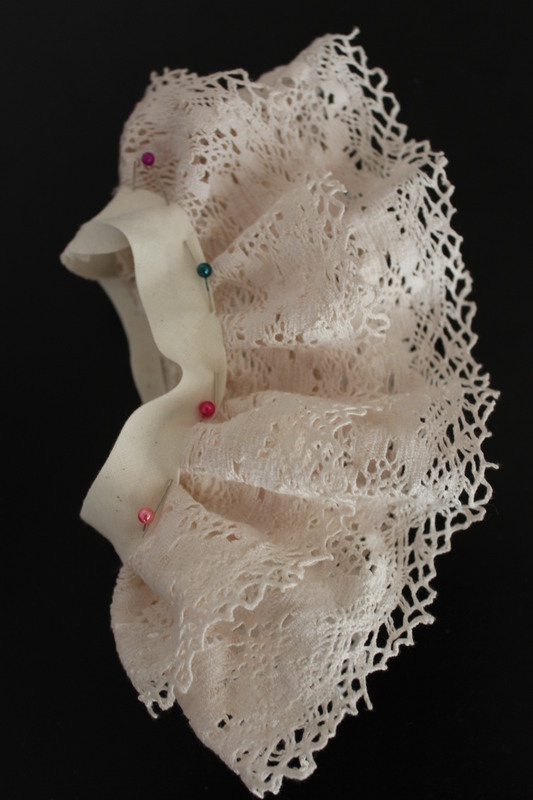 Inspiration: Erin Lee´s 19th century lace cuffs. Pattern: none, I just gathered and stitched. 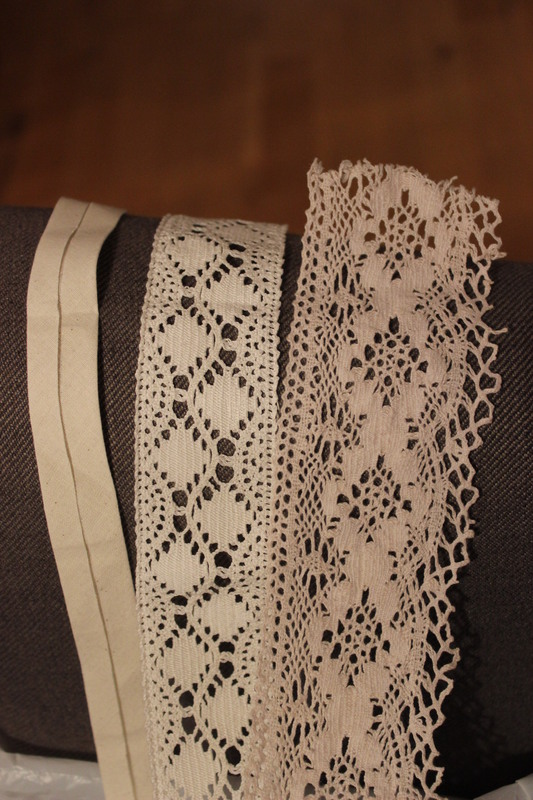 Notions: a total of 3 m of cotton lace, 60 cm of bias-tape and thread. They are completely hand stitched, and hand dyed with natural material. Maybe 5/10. Time: 4 hours including the dying. First worn: I hope to wear them on an up-coming costume event this november.